If you do not have naturally curly hair, the chances are you have already tried using a curling iron to get the playful texture. There is no doubt about curling irons being magical devices for your hair, but you need to learn how to use them correctly to get curly hair and to add perfection and definition to natural curls. Keep reading to learn how to use a curling iron perfectly to get great curls. 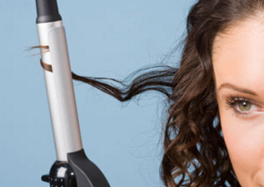 You know you need a curling iron but you may have little knowledge about how to use it. That is not a problem. Here is what you need to know to make the right use of your curling iron. Not every curling iron available in the market is right for your hair. It is important to have a clue about the type of look you want to achieve with a curling iron because this will help you select the right barrel size. An iron with a diameter of a couple of inches is perfect to create loose curls, but you will need a 0.75 to an inch-thick iron if you aim for tighter ringlets. It is important to pick a right heat setting, and you can determine your setting by knowing your hair type. Your heat setting should be 200 degrees or lower if you have fragile, fine, or color treated hair. It is okay to go higher if you have already curly hair or your hair is thick and coarse. Be sure to pay attention to how your hair responds to different heat settings while you curl your hair. Change temperature if you are not getting desired results. Be sure to prepare your hair for the heat treatment. For hair that is naturally oily and limp, it is best to start by washing and conditioning. Use a volumizing product to achieve best results. Then, use a spray for heat protection – spray it from roots to ends. For a fuller look, use a stronghold mousse and then blow-dry your hair upside down. You should avoid washing your hair before curling if your hair is not naturally oily. Start by applying a dry shampoo, then use a spray for heat protection, and finish by applying a stronghold mousse. First, divide your hair in small sections and clip it for easy handling. Create more sections if you have thick hair. Be sure to work from the nape of your neck and move up. Take a section and apply a light-hold hairspray at the ends to create a lift. Start at the roots while wrapping sections around the barrel of a clamp-less iron. Remember to wrap your hair away from your face, and keep it for 10-15 seconds. Once you finish half of your hair, switch direction and hands, remember to start away from your face. After you have done all the sections, you should wait until your hair cools down, use finger to manipulate the hair in order to make it look natural. During the process, do not overlap your hair because the heat would be reduced and hence your hair would become limp. Do not hold hair on the iron for more than 20 seconds. You may want to use a duckbill clip as well if it seems difficult to keep your curls in place. It is even a good idea to use a small piece of tissue paper when securing your curls with a clip – this will prevent clip marks around your hairline. Many women do not realize how important it is to clean the curling iron and other similar products after use. As you have to use styling products on your hair, the residue builds up on your curling iron and affects its performance. With the residue on the iron, it will not distribute heat evenly and leave you with lackluster curls. You do not have to spend a lot of time cleaning your iron – simply take a damp towel and wipe clean your iron once it is completely cool. Curling in the wrong direction will leave you with damaged hair. It will spoil your look completely. You need to curl your hair away from your face to get more natural-looking curls. Be sure to curl towards the left when you are using the iron on the right side of your face. Curl towards the right while on the left side of your face. It is a big mistake to try to twirl the iron in towards your head while your hair is into the iron. You need to do the opposite to get natural curls that have volume and last longer too. Simply hold the iron in a way that its tip is towards the floor and then wrap your hair around it starting from the roots. Finish by locking your ends. It is definitely hard to resist the temptation to feel your newly created curls, but you should avoid it. This is important to get good results even when you know how to use a curling iron. Touching your curls immediately after using the iron will spoil everything. Wait for at least 15 minutes before touching your curls and moving fingers through your hair.